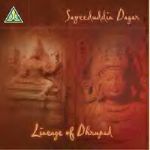 Sayeeduddin Dagar hails from a family whose name is synonymous with the art of Dhrupad singing. He represents the nineteenth generation of Dagar musicians who since the mid 18th century have managed to maintain this great cultural treasure in the face of all adversities. Sayeeduddin was born in 1939 in Alwar, Rajasthan. He began his life-long grooming with his father, Hussainuddin Dagar at the tender age of six, but has benefited from guidance from uncles and cousins of the family, all excellent musicians in their own right. The continuity of the tradition is evident in this recital with vocal support provided by his sons Aneesuddin and Nafisuddin Dagar who are now set to carry the mantle of their forefathers.